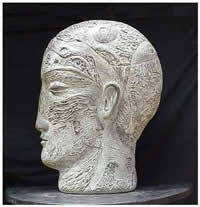 Sculptor Anton Smit was born in the Transvaal town of Boksburg, South Africa, in August 1954. He entered his first sculpting competition at the age of sixteen, and won the first prize. Completely selftaught, Anton Smit was awarded the first prize in the South African Association of Arts' New Signatures Competition in 1979. Following successful exhibitions in Nelspruit, White River, Cape Town and Pretoria, Anton Smit turned to sculpting full-time to cope with the demand for his work by galleries and private collectors alike. With works permanently on display at the Pretoria and Pietersburg Art museums and major art galleries across the counrty, and the Anton Smit Sculpture Museum at the Millennium Art Gallery, Groenkloof, Pretoria, the artist is fast becoming one of South Africa's more important sculptors. During 1990 international recognition came in the form of exhibitions in Rome and Milan, an invitation to exhibit in New York and Hong Kong as well as a return exhibition in Italy in 1993. More exhibitions have followed in Bonn, Washington, Singapore and Koln.